The perfect tights, and they're reversible too! They come up to the waist, have tummy and thigh control, and they flip inside out to another colour! Our top-selling legging in the fall, the Spanx Faux Leather legging elevates any outfit. The wide waistband has some tummy control and shaping power, and sits high at the waist. A top seller by Spanx, these seamless leggings are totally opaque and a perfect fit. They come right up to the waist, and have light tummy control. Fits true to size. 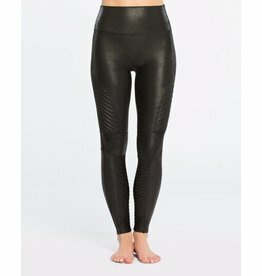 Our most requested item by Spanx, the Faux Leather Moto Legging pulls you in-- in all the right places! The moto detailing on the leg is a fun detail, and the faux leather finish dresses the leggings up. These high quality, thick opaque tights are mid rise, with tummy and thigh support. Perfect to wear all year round.